Over the past day, militants have opened fire on the positions of the Armed Forces of Ukraine 19 times, with two Ukrainian servicemen reported as killed in action (KIA), and one injured in action (WIA), the press center of the Joint Forces Operation (JFO) headquarters has reported. "Russian invaders opened fire on the positions of our troops 19 times. At the same time, the enemy used weapons that were forbidden by the Minsk agreements three times ... Two soldiers of the JFO have been killed, one injured in hostilities," the JFO staff said on Facebook on Wednesday morning. Illigal armed formations opened aimed fire from 120mm and 82mm mortars, grenade launchers of various types, heavy machine-guns, and small arms. The press service also reported on the intensified sniper fire. 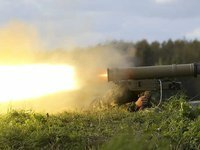 The invaders attacked Ukrainian army positions in the settlements of Stanytsia Luhanska, Novozvanivka, Luhanske, Pisky, Maryinka, Berezove, Chermalyk, Pavlopil, Hnutove, Vodiane, Lebedynske, and Shyrokyne. According to Ukrainian intelligence, over the past day, three invaders were killed and two more were wounded.